The Airline Vikings and Haughton Buccaneers both lost the final games of their first District 1-5A series Monday. The Vikings fell to Byrd 5-1 at Airline in the completion of a game suspended Friday. The Bucs dropped a 5-4 decision to Southwood at Southwood. The game was rained out Friday. Haughton still won its series two games to one after sweeping the Cowboys in a doubleheader Saturday. Airline lost its series by the same margin. 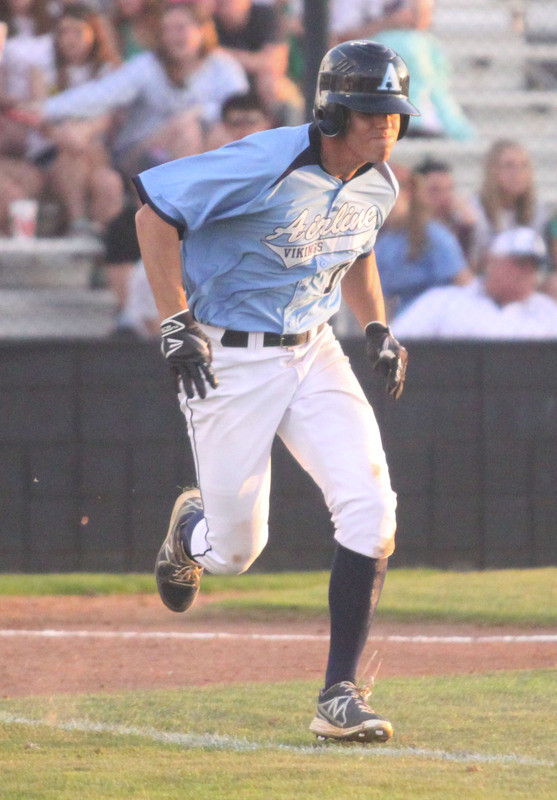 Airline’s Cameron Taylor hustles to first after getting a hit during the Vikings’ loss to Byrd Monday at Airline. After the first go-round of three-game series, Parkway (2-1), Haughton (2-1) and Byrd (2-1) are tied for the district lead. Airline, Southwood and Captain Shreve are one game back. The Byrd-Airline game was resumed with Byrd holding a 2-0 lead in the first inning. Airline had seven hits to Byrd’s eight, but the Jackets made the most of theirs. Airline had opportunities with runners in scoring position but couldn’t get the big hit. A couple of Vikings were put out advancing to home. Cameron Taylor went 2-for-2 for Airline (7-12). John Snyder, who allowed five hits in six innings and struck out five, got the win for Byrd. John Henderson had a two-run homer in the fourth. Chad Poulson, who allowed five hits and three earned runs in 3 1-3 innings, took the loss. At Southwood, the Bucs (11-11) tied the game in the seventh on a double by John Tomb followed by a single by Seth Ryan. But Southwood scored the winning run in the bottom of the inning on an error with two outs. Tomb went 2-for-3. Ryan had two hits and two RBIs.